If you have pets in your house, regardless of their size, then walk-thru gate 0930PW from Carlson are ideal for you. Small pets can easily pass through the lower door of gate while larger pets remain inside the boundary. Its installation is also made very easy through system of pressure mount. It comes with flexibility of multiple extensions so you can cover smaller as well larger width openings. The release of handle is also made on one touch only so you do not need to free your both hands to open it. It is a gate with so much to offer and that too at an unbeatable price. You will learn in this article a lot of features it has which makes it an ideal walk through gate for smaller as well larger pets. 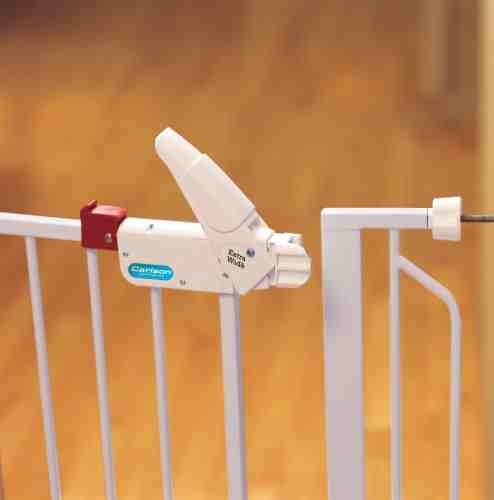 The Carlson Gate is made convenient and every element is designed while keeping the pet’s factor in mind. The designing of gate is done in pressure mount system so that it can easily be installed. Also, adding extension is also possible with this system for accommodating wider openings. This pressure mount will give you a secure and stable fit to your area. The construction of 0930PW is made from 100% steel which gives it strength and makes it a durable product. The pressure mount system apart from making installation easy also complements the strength and makes the gate more secure. This makes the gate chew-proof and it keeps your larger pets away from smaller pets. You can easily pass through the gate simply by lifting the handle which is made in lever style and comes with a safety-locking attribute. You only need one hand to open it so you can also pass while carrying things in one hand or keeping the pet behind from you. The height of gate is 30 inches. This allows you to reserve your larger pets from entering into those areas of your home where they will create a lot of debris or get themselves hurt. The smaller pets, like small breed of dogs or cats, can easily pass through the gate through the little door present on the bottom. The gate can extend from 29 inches width up to 44 inches through the 4 inches and 6 inches extension available. This feature allows it to fit hall openings and doorways. If you use the four wall cups then you can also install it in stair top. It comes with instruction manual, a 4 inches and 6 inches extension, 4 wall cups, 4 hand wheels which are adjustable and 4 spindle rods which are threaded. Gate not made for child. If you have cats and dogs in your house and you want to prevent cat from getting eat by the dog then Carlson 0930PW is the solution for you and that too at such remarkable price. Also, if your dog creates all sort of mess in certain parts of your house and you cannot bear it any more then buy 0930PW. The larger pets will only get them stuck in the little when they try to do some stupid tries. They can only see with their sad eyes behind the bars of the gate and you can easily keep doing your work or carry out your routine life without any worries for your pet. The gate is invincible for them because of the steel material used unlike other gates which are made from wood which gets tear apart easily. Installation is so easy and quick that some users can even complete it in just around 15 minutes. You just need to follow the manual and everything will work perfect. This gate will work very well even if you are a small height person. The gate is specifically designed for the smaller pets to move by while keeping larger pets contained. The quick installation which is also hassle free and the pressure mount system which avoids streaks also gives user an extra comfort. The lever style made handle which gives a secure lock and can easily be opened by one hand makes walk through the gate more easily. The wide opening makes it possible to fit in a variety of openings of doorways and between halls as well. Take the wall cups into use and you can also use it at the top of the stairs. The gate offers this much for a very long period of time because of its steel construction which makes it unbeatable at such a good price.